Back in January I posted about my one and only goal I’m focusing on this year, Getting my first probate deal. If you’ve been following my blog you’ll know that I did not succeed in accomplishing that goal which had a target date of March 1st. This goal is still however at the forefront of my efforts and it will happen sooner then later. Over the past couple months I have made some very good progress and have, along with my partner Bruce, put in offers on 6 houses. In terms of % Call Back, my best month has been the Oct-Nov list. The main reason for this is that I’m still actually getting calls from letters I mailed this list right now, so it’s safe to assume that the numbers will rise in Nov-Dec and Dec-Jan. Beginning this month I’m going to start sending out a 3 month reminder to those people in Oct-Nov to see if I can squeeze out some more calls from that list. If the person called before, I will send out a greeting card with a quick message, if they have not called yet I will send out another postcard. I want to keep my name in front of them. I don’t have stats for Jan-Feb yet, because those mailers just went out. I actually did get a voice mail today from a guy that was non to appreciative of getting my letter. Glad I didn’t answer the phone. I’ve been contacting Realtors who have short sales listings over the past month. I would be lying if I said it was going well. The Realtor seems to be exited about having some interest in the property from a buyer, but as soon as I mention that Nick wants to handle all the negotiations the conversation stalls. I’m probably not explaining the situation correctly or in a way that puts the seller at ease, but I’m going to continue to work on my delivery. After doing a little more digging, the holdup seems to be with the Seller’s Real Estate Attorney who has already been granted the write to negotiate on the sellers behalf and doesn’t want to give up that power for some odd reason. Over the past 3 months my blog has grown pretty steadily which I’m quite happy about. I’ve been really trying to create better posts by doing research on the current days topic and expanding on my experiences. This has not only created better posts but has helped me learn quite a bit. Probate Mondays, Lessons Learned and various other series have been successful and I’ve really found my niche with Probate Investing. 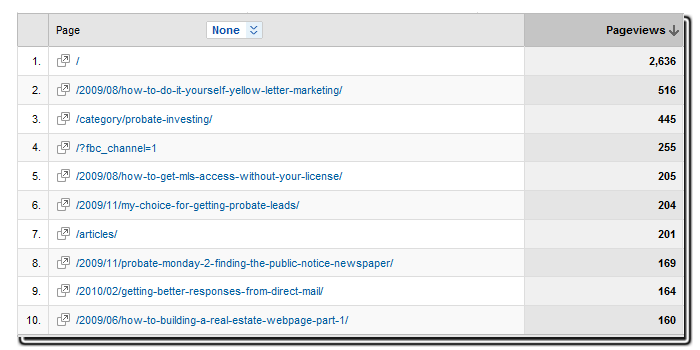 This can be seen with the Keywords that people are finding my blog at. 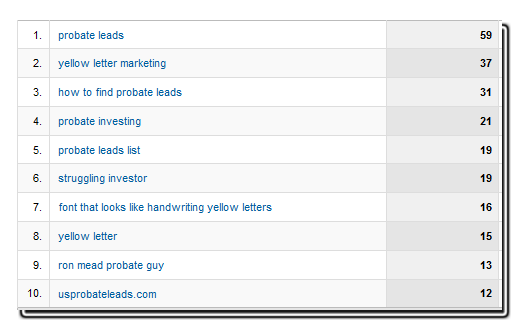 Take a look, Probate related keywords represent 6 of the top 10 spots…. Many thanks go out to Stephanie Davis at FlipThisWholesaler.net, Shae Bynes of GoodFaithInvesting.com, Casey Anderson from RealEstateInvestingNewsWatch.com, Matthew from FlippingCrazy.wordpress.com and Craig Fuhr at CraigFuhr.com for sending people my way. Lastly I wanted to share the top 10 pages on my site over the same three month period. 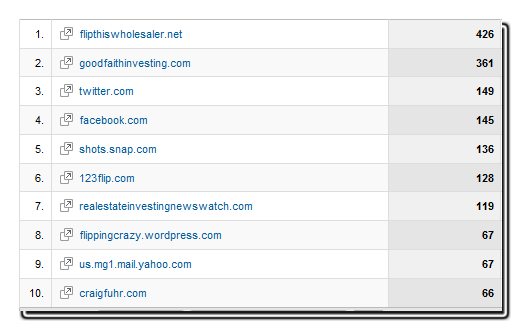 It’s good to look at these things on your blogs as it’s proof of what your readers are most interested in. One good blogging technique is to write follow up articles for these popular ones to attract even more traffic. The top spot is my homepage, which should naturally get the most traffic. Surprisingly though the number 2 spot is taken by an article Justin McClelland wrote for my site about Yellow Letter Marketing. It’s very important to thank everyone who visits my blog and those who write articles and post comments as you people really add some valuable information and content. so Thank You! Here’s to an even better 2nd quarter! This is great to see, Scott! I listened in on a webinar last night about making real estate investing an actual business (which most investors don't do well). Something the speaker (Vena Jones-Cox) said really stuck out to me: “What isn't measured, isn't improved”. So true! Good job on doing it right, right from the start! What's up Scotty! I always love to see these types of updates to see the results others are getting from their direct mail. I'm still getting 3-6% response myself. We're going to make a breakthrough with the realtors (on the short sales)…its just a matter of time. Keep plugging! I love measuring my business and my blogs stats. First thing I do in the morning when I get to work.